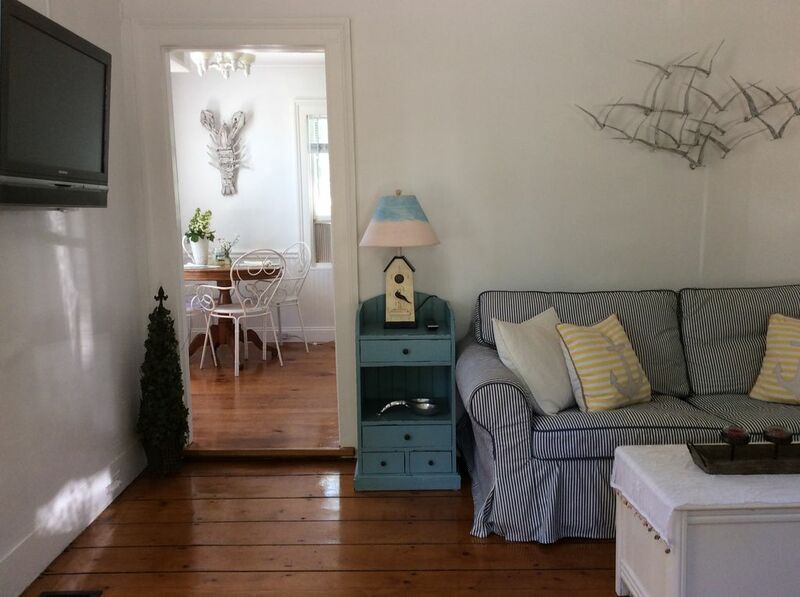 Beautifully Renovated Two Bedroom Cottage in the Heart of Downtown Mystic. Sleeps up to six, car not needed. The charming 'Circa 1849 Mystic Arbor Cottage' has been completely and beautifully renovated.Located in the heart of Historic Mystic, you can easily walk to all the restaurants, shops and attractions as well as the harbor and the Mystic River. We are located in a quiet neighborhood with a lovely private yard. This 1000 square ft house is entirely outfitted for a relaxing stay. There are 2 bedrooms, one with a king bed & the other with a queen. Both have luxurious linens and bedding as well as air conditioning and ceiling fans. There is also a full size pull out couch in the living room. The living room has plenty of comfortable seating, ceiling fan, writing desk, and a 32' plasma TV with DVD player. The fully equipped kitchen has a table & chairs, granite counter tops, and stainless steel appliances. One bath has a walk in shower on the first floor and on the second floor there is a full bath with cast iron soaking tub. Hi, I am the property manager . I've been in the vacation rental business since 2002 and am proud to offer this beautiful retreat for your stay. As manager I aim to answer all of your questions and would love to help in anyway . Thank you for your consideration of our Cottage. My family and I recently stayed at the cottage and we had a great time. The house was so charming and clean. We loved the character of the home! The location was so convenient, we walked back and forth into town throughout the day. Susan provided excellent communication as well. Great place to stay... well equipped and clean. Had a great getaway in mystic! The cottage was perfect for our family. It was within walking distance to many great shops and restaurants. We would definitely come back and recommend to others. The home was beautiful, clean and open. Made for a perfect weekend in Mystic. Such a beautiful, quant cottage. Perfectly placed in the heart of Mystic. Fit our family of 4 plus our dog wonderfully! It was our second time staying on the cottage. It's surprisingly open for such a relatively small home. A large master, decent second bedroom and large bathroom (with a tub!) upstairs, and a large living room, a kitchen and a very functional full bathroom (with washer and dryer) downstairs. Plus a partially covered patio, large yard and off-street parking. This cottage is obviously quite old (the stairs are not for the faint-of-heart), but it is so bright, airy and modern inside. And it's super, super clean! We instantly felt at home! If you're looking for a place to stay for a family of 3 or 4 or two sets of friends - that is walking distance to downtown and the Seaport - this is the place for you! There are so many restaurants nearby that the compact kitchen size wasn't an issue. We had such a wonderful time in the Mystic Arbor Cottage. The house was spotless, Beds were comfortable and although it rained during our stay, the backyard and terrace are lovely. We felt totally integrated with the historic atmosphere of this charming town. Highly Recommend.